The classic portrait of Spain’s most powerful queen who united Castile and Aragon, brought Renaissance artists and musicians to Spain, sponsored Columbus on his famous journey to the New World, conquered the Moors, expelled the Jews, and started the Spanish Inquisition. Who then, was the real Isabella? Was she, as some people believe, an unrecognized saint worthy of beatification because of her charity to her subjects, concern for widows and orphans, and insistence upon cleansing the Church of corruption? Or was she a heartless bigot — a religious fanatic who forced conversions of Spanish Moors and Jews to Christianity on pain of death through the tortures of the Spanish Inquisition? Or was she, as history suggests, a brilliant woman — the only European monarch who understood the implications of a successful transatlantic crossing — and consequently sponsored Christopher Columbus’s famous journey to the New World. Who then, was the flesh-and-blood Isabella? As this famous biography reveals, the Queen was a very human blend of those three historical images. 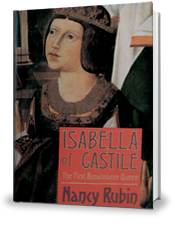 Isabella of Castile describes the complex social and psychological forces that drove the queen to become one of history’s most legendary and quixotic monarchs, a monumental figure who is alternately revered and despised to this very day.